The Artificial Intelligence Foundation course is brand new BCS Accredited course. We have just released initial course dates, and further content about the is being added asap. Artificial Intelligence Foundation Certification incorporates and builds on the essentials certification to develop a portfolio of AI examples using the basic process of machine learning. It shows how AI delivers business, engineering and knowledge benefits.. Examples are presented; drawing on standard open source software and cloud services. Candidates will explore what is required to develop a machine learning portfolio and given access to the examples for on-going self-study. 1.4 Describe how AI is part of ‘Universal Design,’ and ‘The Fourth Industrial Revolution’. 1.5 Describe a modern approach to human logical levels of thinking using Robert Dilt’s Model. 1.6 Describe the three fundamental areas of sustainability. 2.2.2 general ethical challenges AI raises. 2.5 List opportunities for AI. 2.6 Describe how sustainability relates to AI and how our values will drive our use of AI and how our values will change our society and organisations. 3.1.4 describe four types of agent: reflex, model-based reflex, goal-based and utility-based. 3.4 Recall the basic theory of ML. 3.5 Describe the basic schematic of a neutral network. 3.6 Know how to build a practical Machine Learning Toolkit. 4.2 List future directions of humans and machines working together. 4.3.1 Describe the type of team members needed for an Agile project. This tutor led course is a fantastic opportunity to engage with an AI Expert. The AI Foundation course builds upon the basic knowledge of AI. Over the 3 days the course will take you from a basic understanding of AI to the ability to create your own AI product. Those individuals with an interest in, (or need to implement) AI in an organisation, especially those working in areas such as science, engineering, knowledge engineering, finance, or IT services. Once the AI body of Knowledge is completed, reviewed and published (End of March 2019) it will be release to all course delegates prior to course commencement. Further details will be added in Q1 2019. 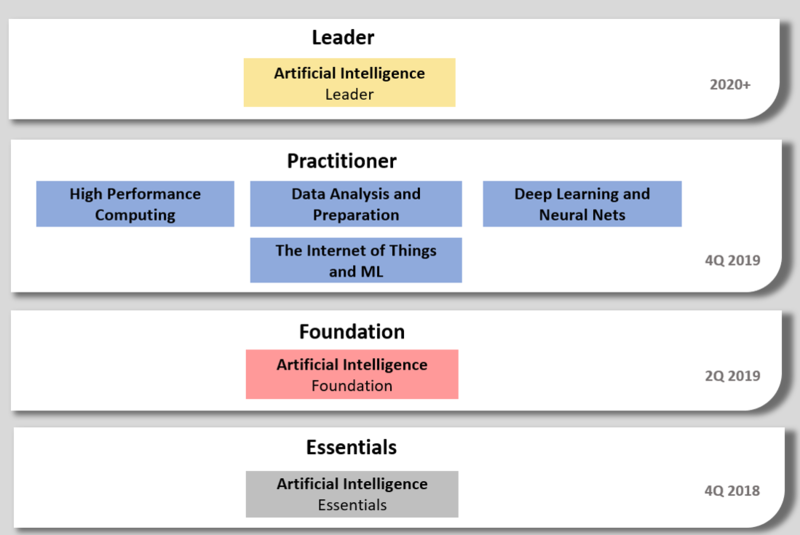 The full BCS Artificial Intelligence course framework is set out below. We hope that you have enjoyed our AI training courses and that they have added value to your career and future prospects. If you wish us to add anything to the portfolio please let us know.